In the next few weeks, I'll be discussing each of these topics, and others, in depth here at http://mec.dru.ca . I've been a member of MEC since 2004, and I've been a supporter of co-ops for much longer. I grew up in a forest of cedar and fir on the west coast, and much of my childhood was spent around campaigns for the protection and health of wild salmon. I attended university in New Brunswick, where I became involved in journalism, studied philosophy and technology, and became involved in groups working for social justice and environmental sustainability. I became heavily involved in the anti-war movement after the US and Canada invaded Afghanistan. I've spent months in Canada's varied landscapes and wilderness, from the south shore of Newfoundland to Quebec's boreal forest, from the Athabasca River in northern Alberta to the Gulf Islands and coastal mountains of BC. My partner and I have hitchiked across Canada three times. For years, this has been the main reason for my membership in MEC: for lightweight camping gear, durable hiking boots, and a good tarp. In 2003, I founded a grassroots newspaper - the Dominion - with some colleagues. After a year in Halifax post-graduation, I moved to Montreal in 2005. While supporting myself with freelance web design work, I have done thousands of hours of work in groups advocating for the rights of Indigenous peoples in Canada, climate justice, justice for missing and murdered Indigenous women, and a just Canadian foreign policy. In 2006, we transformed the Dominion into a co-op, and the paper is now part of a network. The Media Co-op, as it is known, has since grown to have local chapters in four Canadian cities. A large part of my role in recent years has been to build structures that enable our 500 members to participate in decisions that affect the direction of the co-op. I have also worked as an associate member of Sustainability Solutions Group, a worker co-op that helps organizations reduce their environmental impacts. SSG's approach looks at everything from heating systems and insulation types to activities for participatory institutional decisionmaking. I recently joined the board of Koumbit, a Montreal-based not-for-profit tech company that has been truly innovative in creating a cooperative culture in their day to day work. At Koumbit, the workers make decisions democratically, and resources are available for employees to be paid to work on web sites for community organizations, or free software that benefits everyone. As many members undoubtedly have, I started out thinking of MEC as a place to get high-quality gear for low prices. Since then, I have learned a lot about MEC's leadership in adopting sustainable building and business practices. I was also impressed by MEC's decision to give 1% of its gross revenues - amounting to millions of dollars in recent years - to environmental initiatives. The co-op's efforts at ethical sourcing have also been a major step forward. In these and other ways, MEC is light-years ahead of the vast majority of Canadian businesses. For these steps, it is to be commended and recognized. It is also time to consider next steps. There is vast room for improvement in many areas. My experience with co-ops has evolved in parallel to MEC's progress. 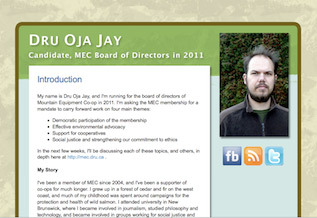 I want to be a part of MEC's board because I feel that my experience in building democratic structures and working for social justice and environmental sustainability can help MEC take their leadership role in these areas to the next level.